Work Notes Pro is a free Windows 8 notepad app available under “business” category of its App Store. This notepad Windows 8 app is a bit advanced app that lets you save notes in various types such as text note, audio note, photo note, video note, map note, and drawing note. You can select any note type in this free version and save your notes accordingly. In addition, this notepad Windows 8 app lets you view reports of all your saved notes in the form of a pie chart. 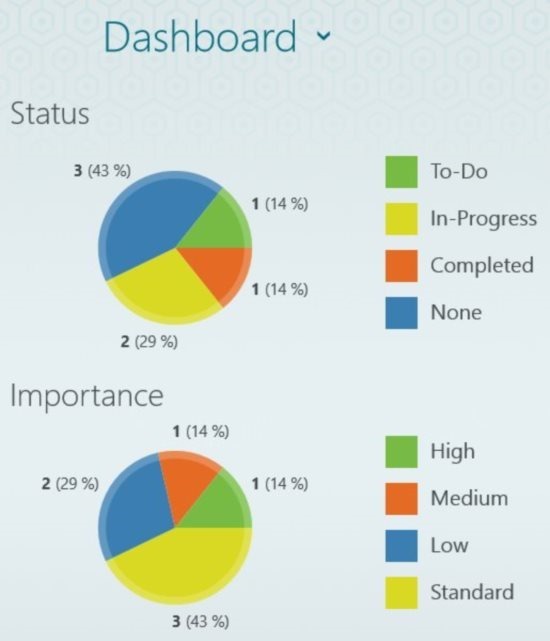 Pie chart displays the percentage of the notes status which include To-Do tasks, In-progress tasks, and completed tasks. Well, this was the short summary of the awesome Work Notes Pro app for Windows 8. Moreover, you can use this Windows 8 notepad app with some more additional features like setting up the reminder for any task recorded, setting up the importance level, setting up the status, adding tags, and much more. Explore more options like making the font bold, italic, and underling any text or word. You can even align the text with ease. The good part of this notepad app for Windows 8 is that you can easily share the notes to the popular Evernote, OneNote, SkyDrive, Dropbox, Facebook, and Twitter. Another good part of this Work Notes Pro app is that you can make you notes private which can be only saved to your personal SkyDrive. Also, check out our posts on Notepad ++ for Windows 8, Memo Stick App, and Creative Ideas App. 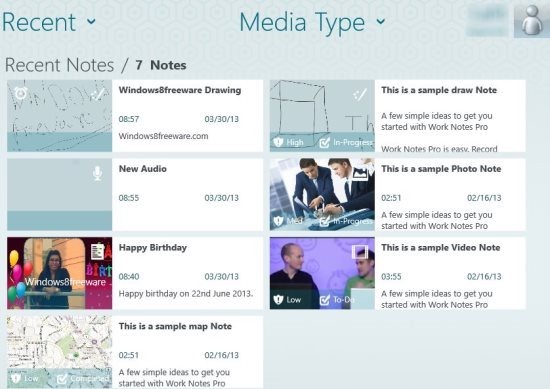 Create multiple types of notes which include text note, video note, audio note, photo note, drawing note, and map note. The interface of the app looks simple and easy. The app shows the notes count of each type of note created. You can easily check the pie chart data of your notepad status. Also, works as a reminder as you can easily set reminder on notes saved. Sort according to notebooks, tiles, recently added, status, importance level, and locations or according to media type. To download this Work Notes Pro app, just login your Windows 8 App Store. Search for “Work Notes Pro” app and click on install button. The app will be automatically downloaded and installed on your Windows 8 PC. Else, simple open this link in IE10 and continue with the same procedure. Work Notes Pro makes your notes recording simple and organized. Now, you don’t have to think about saving any type of note; just save them right on your Windows 8 PC with ease. I like the reminder options and setting up the importance level according to the notes.